After not buying *too much stuff for the past few months, the moment I got my first big girl paycheck, I did some damage. I've since been doing damage and I need to stop. I have a post coming soon all about my shopping addicition because I am pretty sure it's a real problem I need help with. Maybe my mom has to control my finances? I don't know but something needs to be done. But yeah, I've been on a buying storm and some things I really needed, some things I definitely could've done without. This is some stuff I bought a few weeks ago after I first got paid and I justified them in more ways than one. The beauty products are things I bought about a month ago but never blogged about because #bloggerfail. 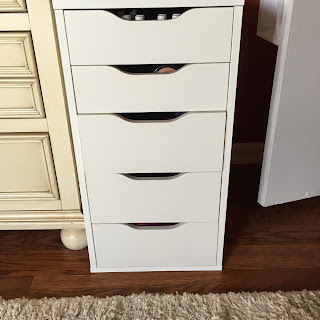 IKEA Alex Drawers: Since working for a beauty brand, I have acculumated a massive amount of make-up. I feel like one of those Youtube vloggers that have a horrific amount of make-up. I already had a lot of make-up and have just gotten a stupid amount the past month. I didn't have a place to store everything and I'm psycho about space & organization so I needed something. 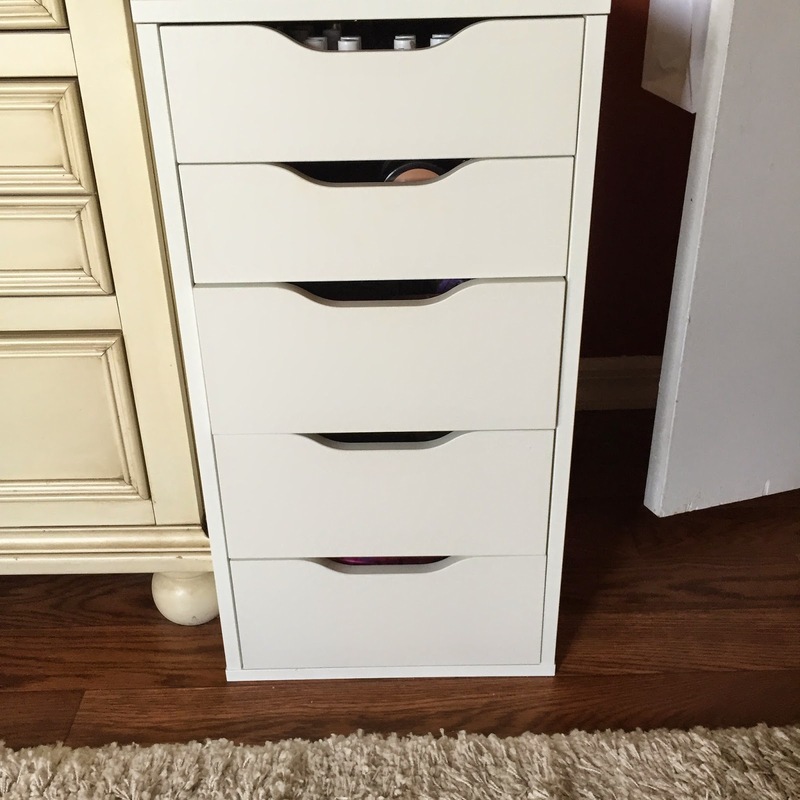 I know every vlogger uses the Alex Drawers so I figured that was a great place to start. I put together the drawers BY MYSELF!!!!!!! over the course of two days. It was difficult and I screwed up some drawers but it turned out fine. UGH, I love them & I'll be doing a full post on them & how I organize my make-up. 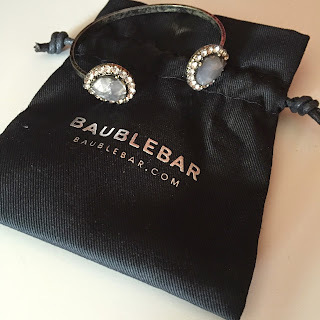 BaubleBar Teardrop Cuff: I haven't purchased a BaubleBar piece in MONTHS and I knew I needed something new. I've been wearing one particular BaubleBar bracelet for the past few weeks and I knew I wanted something else. After having a cuff that I wore nonstop in my first & only Rocksbox, I knew I wanted a cuff. The Lighting Teardrop Cuff caught my eye and I just had to have it. It's so comfortable and light weight, you forget you're wearing it. I love wearing bracelets but I hate when I'm typing and they dangle against the keyboard. That's why a tight cuff is perfect for everyday wear. Kate Spade Cedar Street Marieta: Over the past few months, I haven't been using my big Kate Spade wallet, mostly to bring back and forth to work. I didn't see the point and it was weighing my bag down. I was using a coin purse my mom got me for Christmas but I wanted something a little more sophiscated. I wanted a nice little wallet that was light weight and portable. I decided on Kate Spade (because I don't buy anything else basically) and found this adorable little card holder. It's not really a wallet, it only has one compartment but it's amazing. I have been obsessed with it & I'm so glad I got it in red! It's so different from what I usually buy and I'm glad I stepped outside my comfort zone. It's easy to find in my bag and it's so light. It's amazing and I love the tininess of it. 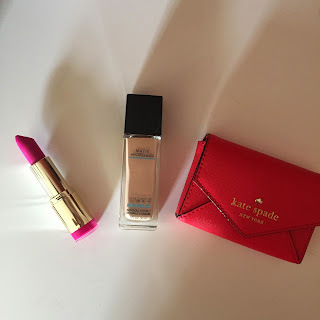 Maybelline FIT ME Matte & Poreless Foundation: I was in need of another foundation and I really wanted to try this one or the Maybelline Dream Wonder Fluid Touch Liquid Foundation but it was $12 and I wasn't in the mood to shell out that money. I had heard people going insane over the Maybelline FIT ME Matte & Poreless Foundation. I had been curious so I decided to pick it up. It has quickly become one of my favorites. I got the shade 235 which probably is a tad dark for me but it'll be awesome in the summer when I'm tan. It's very liquidy but not too liquidy. It is medium-full coverage and I can see a noticeable difference in my skin when I wear it. It stays on pretty long too and it just makes my skin look fresh and flawless. It's not too matte, it seems to be a demi matte finish so it allows your skin to breath & doesn't look like you're wearing a mask. I'm addicted. lipsticks so I knew it would be good. Orchid is the hottest, Barbie pink I have ever seen and I was a little scared to wear it. I wore it to my sorority formal last month where I wore a white dress and it looked amazing. 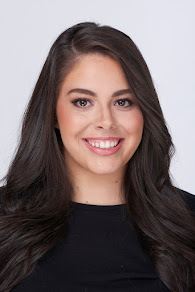 It's a great statement lip alternative to red and it's perfect for summer. I will definitely be wearing this more in the coming months, especially when I have a tan! I feel like I've purchased some more things but I will feature them in more posts like this coming up. I like to keep things I've purchased around the same time in the same post--that's the type A in me! What have you purchased recently? Tell me in the comments and help me not feel bad about my shopping addiction!